President Trump on Sunday used his Twitter platform to try and discredit James Comey and Andrew McCabe, whose FBI careers were cut short amid acrimony over the Russian-meddling probe and how the bureau handled probes into the Clinton family. Both men reportedly kept memos detailing their interactions with Mr. Trump, which could factor into Special Counsel Robert Muellers investigation of any ties between Russia and the Trump campaign, or fuel potential obstruction of justice charges against the president. Mr. Trump downplayed their relevance on Twitter. Spent very little time with Andrew McCabe, but he never took notes when he was with me. I dont believe he made memos except to help his own agenda, probably at a later date. Same with lying James Comey. Can we call them Fake Memos? Mr. Trump said. Mr. Comey, who was fired in May, told Congress he kept detailed notes on each of his interactions with Mr. Trump, including a meeting in which the president allegedly told the lawman to lay off former National Security Advisor Michael Flynn, who was ousted for misleading Vice President Mike Pence about phones calls with Russian Ambassador Sergey Kislyak. ...and who exactly would be exposing these crimes....???? Keep on talking and tweeting President Trump...otherwise we would know nadda. Nowadays the wagons circle themselves around Democrats. Than you Mr Rove. That strategy worked so well for your President. Trump needs to stay our of the weeds on this crap. I agree with you. Trump needs to let these guys hang themselves. I see no real desire on the part of Congress to bring closure on the Meiuller investigation, despite the serious damage Mueller and his team is doing to the country , especially in the foreign policy areas. Trump needs to learn to shut up and let the criminals be exposed by others. Ridiculous. There are no "others." If Trump does not expose these criminal bastards, he will be taken out by them. This is a fight to the death, and you are on the wrong side. 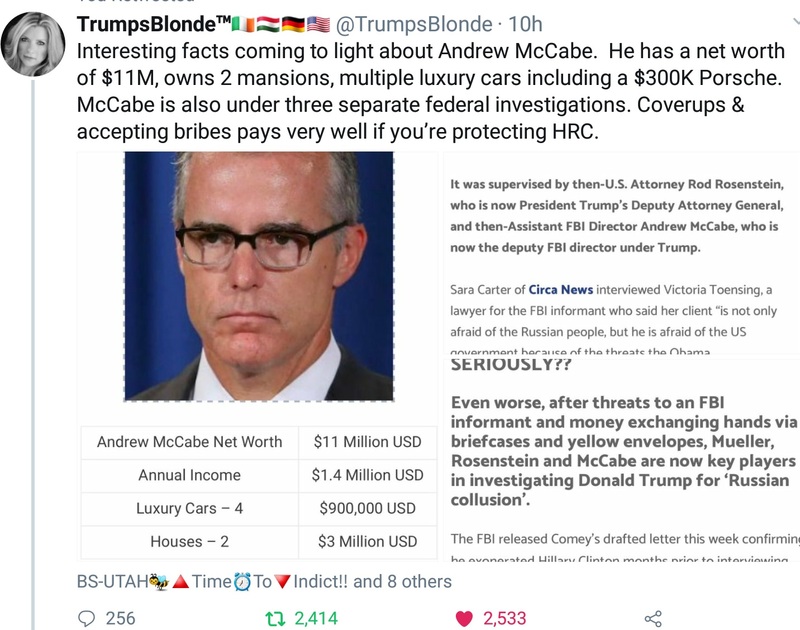 Andrew McCabe's net worth ....$11-million HOW DID HE DO IT?? Trump needs to learn to shut up and let the criminals be exposed by others. He is not helping his own cause. When one of the swamp creatures is outed, like McCabe, the creatures scream and howl like Godzilla in the movies when it was killed. 'W' didn't fight or do anything when he was attacked and vilified. What did keeping quiet do for him. It made way for Obama. And, Obama made way for Trump. Remember, W’s daddy and granddaddy already smudged the family’s history. These corrupt BASTARDS can write any damned thing they want in their personal memos, REALLY they THINK we are going to believe what the HELL they wrote, these IDIOTS really DO BELIEVE Americans are this STUPID, absolutely unbelievable!!!!!!!! These CORRUPT BASTARDS just make me want to scream, they are SO ARROGANT because when you work for the damned government you can do WHATEVER IN THE HELL you want with NO CONSEQUENCES!!!! This ASSHAT McCabe only LOSES his pension until he turns 56 years old, THEN he will receive his full pension after being FIRED or not!!!!! Perhaps if REPUBLICANS would consider DEFENDING HIM, he wouldn’t have to speak up. I have to agree at least on this...these kinds of tweets don’t help him. He should tweet out videos of news reports and news articles which outline their illegality and let the articles / videos speak for themselves. His wife is a pediatrician, so her income must be substantial.....if its added into the figure attributed to McCabe. Still, $11 million annual, a Porsche and other luxury cars, and two mansions does seem extreme. Somebody ought to check his wife’s medical income from Medicare/Aid. What do you think things like the Nunes and Grassley memos were? The press chose not to report them. He should just link to news articles about them and videos reporting them and let them speak for themselves vs. insults which the press will report on instead of the substance of what these guys did wrong. I wish President Trump would send things like that out instead of his personal insults / wise cracks and just let the facts speak for themselves. His tens of millions of followers would retweet and go viral, going around the press. The insults and wise cracks don’t inform people of what is going on. He did. How many Republicans, even AFTER those memos called for an end to Mueller? Democrats are a dead party nothing can save them now he’s just one of many exposed more to ensue for all.